It takes everything you know about Santa and turns it on its head. The cute promo at top doesn't give a clue to how bad it really is. Santa doesn't live at the North Pole, but in outer space in a crystal castle. There are no elves to help him, just children he has kidnapped from around the world who sing to him in trance-like voices. Remind you of a scene from Evil Dead 2? After several narrow escapes, Santa does defeat the devil and deliver his toys to...well...five houses in Mexico City. 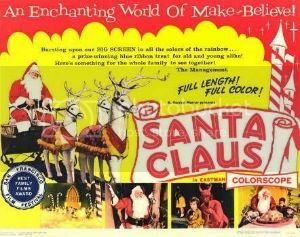 Can anybody think of a Christmas movie that they regret seeing, or seeing again looked funny when it was just horrible? Every year I try to get my family to watch the MST3K version of Santa Claus Conquers the Martians. Once was enough for them, alas.